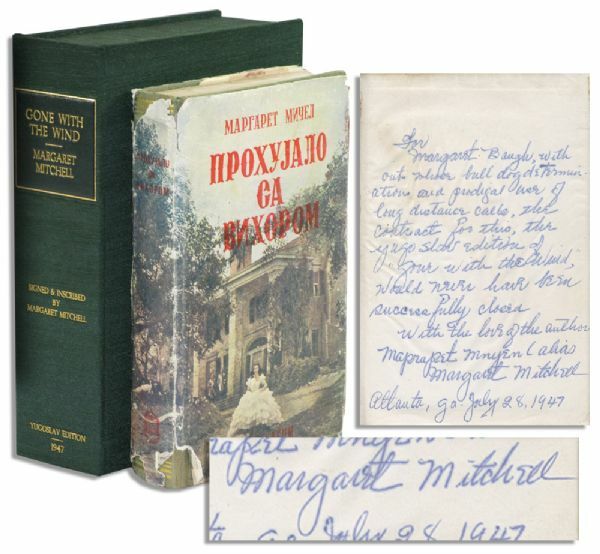 Extremely rare Margaret Mitchell signed copy of ''Gone With the Wind'', with a full-page inscription in her hand. Upon the fly-leaf, Mitchell writes to her personal secretary, reading in full: ''For Margaret Baugh, without whose bull dog determination and prodigal use of long distance calls, the contract for this, the Yugoslav edition of 'Gone with the Wind', would never have been successfully closed. With the love of the author, Maprapet Mnyenl alias Margaret Mitchell Atlanta, Ga. July 28, 1947''. Bound in hunter green cloth boards with gilt lettering, book is the first Yugoslavian edition of ''Gone With the Wind.'' Measures approximately 5.5'' x 8.5''. Very good to near fine with fair dustjacket.